From World Expo to one of the Guardian’s best albums of 2016. 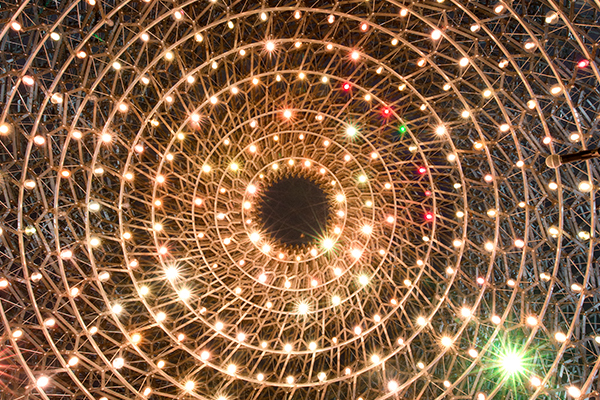 Be play One harnesses the sounds of live bees for mesmerising performances across the UK. Highlighting the crucial role of pollination by bees, The Hive is an interactive sculpture with 32 horizontal stacked layers of hexagonal aluminium twisted together to suggest a swarm of bees. It was initially created for the 2015 Milan Expo to draw attention to the issues of food security and biodiversity. We were tasked with allowing listeners in Milan to experience a live signals coming from beehives situated in Nottingham, England. The bee signals were transmitted live over the internet, which –through amplitude and frequency – triggered musical events in the soundscape and lighting patterns within The Hive exhibition. This is an ever-evolving and multi-faceted project that provides a truly immersive experience through the power of digital connectivity. Our Audiovisual team designed a distributed soundscape system installation. It was integrated into the sculpture via a high-quality active loudspeaker system architecture, driven by a central show controller, and with staff user-interface provided via authenticated touch screens. The 360° immersive sound field had 3D space panning, and featured upper and lower rings of compact, integrated mid/high frequency loudspeaker units, plus subwoofers around the glass floor. We also completed a redesign of the soundscape and bone conduction devices for a longer lifespan when The Hive was moved to its new home at Kew Garden. 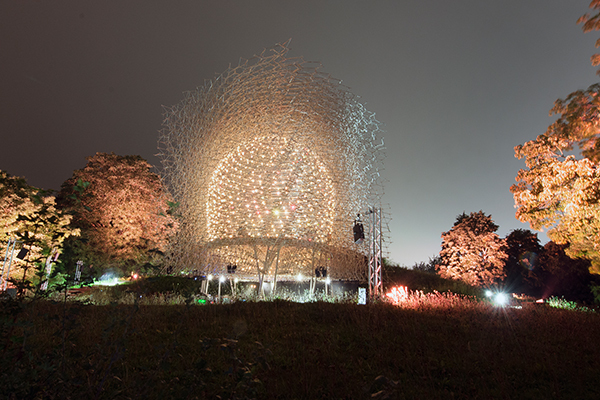 Its soundscape composition was driven by installed sensors, this time within Kew’s very own beehives. Incredibly, The Hive’s soundscape composition from 40,000 bees and 12 musicians got signed to a record label. It shot to #11 in the Official Vinyl Music charts and was even named by the Guardian as one of the best albums of 2016, next to Bowie and Beyoncé. The record toured live across the UK, from the Nottingham Arts Theatre and Sonos Studios in London, to Coventry Cathedral and Glastonbury Festival. For each venue, we designed and production-managed the immersive sound and visuals, and will continue to do so at further shows and throughout 2018. 2020 Dubai Expo, Al Wasl Plaza.